Universal Analyzers Inc. offers a new 24"x 20"x 12" (HWD) Weatherproof, Portable or Wall Mountable 3100 Series Sample Gas Conditioner. 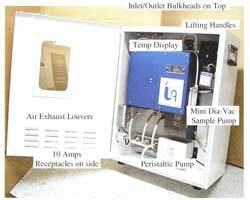 An integral 8-12 Lpm, (12% H20), Thermoelectric Condenser and Sample Pump provides a filtered, 3-10 psig/4.0°C Dewpoint Sample Gas Ready for Analysis. The 3100 Series Gas Conditioner is the Ideal Choice for Stack Testers and other Outside Permanent Gas Conditioning Installations. Universal Analyzers Inc., 1771 South Sutro Terrace, Carson City, NV 89706. Tel: 800-993-9309; Fax: 775-883-6388.